Ramblings of a Bionic Writer and High Desert Action Heroine: HELP MAKE A MIRACLE HAPPEN! HELP MAKE A MIRACLE HAPPEN! Would you like to be part of a miracle? 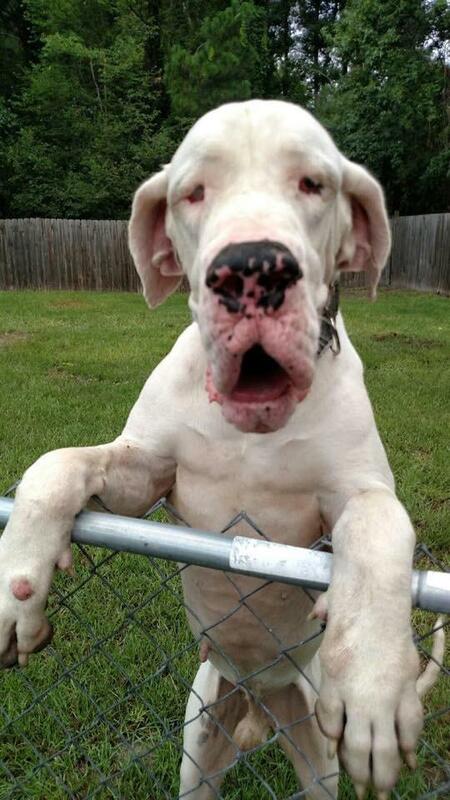 Then check this out: Waters Edge Great Dane Rescue has just four more days to raise $1,675.00. If they can do that, a miracle happens-- BISSELL Pet Foundation WILL MATCH IT. For a small Great Dane rescue, this is, indeed, a miracle. The scoop is that they are treating terrible medical issues and neglect for 10, yes, TEN, Great Danes sent to them from a hoarding situation in August, where 66 Great Danes were pulled from one house in Arcadia, Florida. Some were starving, others were sick, overbred, full of parasites. The gorgeous, sweet-souled boy you see below is called Pawley, and he's scheduled for eye surgery on September 17th. He loves everyone and everything, and has been known to kiss horses (I am not kidding). If everyone who reads this sends just $5.00 and SHARES it-- on their blog, Twitter, Facebook everywhere-- Waters Edge might get that wonderful miracle! Wouldn't it be awesome to be able to say you helped make that happen? Thank you!